Everybody deserves a good family dentist… question is how do you choose? Not all family dentists are created equal, just like any other profession. 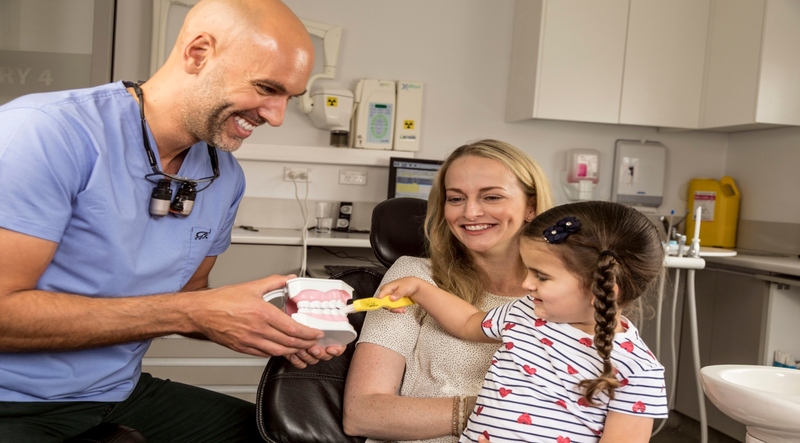 Family dentists in Maroubra and elsewhere, bring with them a wide variety of experience, training, and specialist areas of clinical practice. Then there’s the personality and nature of the individual dental clinic; a little less tangible maybe, but almost as important. “I manage and run a patient education site ‘jamiethedentist’ and I get questions about family dental care asked from all over the country and all around the globe. If they were in Maroubra, Sydney, they could come and see me directly but this is rarely the case”. It’s worth sharing some of Dr Jamie’s web comments with you, as there’s not one dentist that will fit the ‘bill’ for everybody. This group of people is likely to be similar to you in their beliefs, values, hobbies, location etc. which means… if they like their current dentist then there is a high chance you will too. You want a dentist who someone raves about and ideally who they have been seeing for some time, and here I’m talking years. First impressions are important but the dentist who has stayed late to look after you when you had a toothache and who actually remembers your name is the sort I would want to see. Well, I guess I would say that, wouldn’t I? So put it out there: Face Book friends, or on your Whats App group chat, or your local mothers’ group. information to see if the dentist you’re checking out is the right one for you? Bear in mind that most reviews tend to be positive and that word of mouth from someone you know and trust, should be given more weight. Feel free to call a local dental practice, or reach out to the dentist directly – those who care, will make the time to respond and help you out as much as possible. Ultimately you aren’t going to know till you actually visit that dentist, and if after all of this, you still aren’t sure…well perhaps next time you can try someone else. Wherever possible, it’s in your interest to stay with a dentist you like – not only do you each get to know each other and how you like to be treated – but also they get to know your teeth, your situation and develop a history of your teeth over time. Anyway, you get the picture! What exactly is family dentistry and what does it include? Think of a family dentist, like a family doctor, they basically provide all your dental care and then if and when it is necessary, they refer you on to someone they trust who may be a specialist in certain fields of dentistry such as an oral surgeon – say for a difficult impacted wisdom tooth, or a endodontist for a complicated root canal. It is basically general dentistry for the whole family, including, of course, your children. Children’s dentistry makes up a very important part of their work, since establishing good habits right from the start, means fewer problems, less dental treatment and phobias, fewer visits and this ultimately reflects positively the whole family’s health… and your bank balance. Dr Jamie has written in detail about children’s dentistry on this web site…it’s certainly worth a read. Even if you don’t end up going to see him, there are some nuggets of information, which will make the whole process of introducing your child to any dentist a whole lot easier. A family dentist will provide all the preventative dental care, general and cosmetic dentistry you require and this may include some or all of the following: white fillings, dental implants, mouth guards, dentures, root canal treatments, crowns and bridges, fissure sealants, teeth whitening, porcelain veneers, composite veneers, extractions, wisdom teeth, gum disease treatment and more…. What’s in it for the mums (and dads)? As previously mentioned, a dentist often has an area of specialist practice: this could be family dentistry or cosmetic dentistry, but is more likely to be an aspect of one of these such as veneers or dental implants. Dr Jamie’s area of focus is actually family dentistry and skin and facial rejuvenation. He is a trainer and practitioner with AADFA – the Australasian Academy of Dento- facial – Aesthetics teaching Botox and filler training to dentists throughout Australia and New Zealand. He provides not only amazing skin advice, which can help you develop a regime that is backed by science not marketing, but can provide Botox, lip filler, other cosmetic injectables, micro-needling, thread lifts and chemical peels. Dentists know the head and neck anatomy better than most; they have with a keenly developed aesthetic eye and high quality sterilization procedures – so, mums and dads you’d be in good hands! Plus, at our Maroubra Practice, there’s a play area for the kids with books, toys, games and things to draw and colour in, whilst you are being ‘transformed’. Why should I pick Dr Jamie Workman as my new dentist? Well, he’s a genuine, kind and caring dentist, and passionate about ‘getting it right’. This means more to him than any financial consideration, making our practice eminently affordable. His down to earth nature will put you immediately at ease and you will feel confident that you have picked a great professional to look after you (and your family… if you have one). We all want a professional who has our best interests at heart; someone who will take the time to clearly explain what’s wrong; take the time to offer all the different options that may exist. He understands too, that everyone is unique and has different expectations, values, wants and considerations, and he accommodates these, ensuring that you have the best possible experience. The corner stone of his dental work is looking after local families: their teeth, their health, and their facial needs. His enthusiasm and ability to build trust easily (especially with children) combined with extremely gentle hands means that… the once feared trip to the dentist is largely something of the past. Who is family dentistry for? It’s for everyone… from advice on babies’ teeth, to treatment for children, teenagers, adults and seniors. Our Maroubra Dental Practice has looked after many families for over a decade, and we’re always excited to meet the next generation. To assist your visit, we also have a lift: useful, if you have a pram or an elderly relative who may find stairs a challenge. How do you keep family dentistry affordable? The best way to keep the cost of dentistry for your family down is not necessarily to find the cheapest dentist! If your only determining factor is price, a health-fund run dentist may be the way to go… but not always. You need to bear in mind a dentist who drills and fills everything could well end up costing a lot more than a minimally invasive dentist, who favours preventative advice and a more conservative approach. Dr Jamie truly believes in doing his best for the long-term health of his patients and their teeth. Having said all that, our Maroubra Practice accepts all health funds (including BUPA, MBP, NIB, and HCF), so you can make a claim straight away and just pay the gap. A simple filling might set you back $250 but if you put off getting it seen to, and end up with a root canal and crown this could set you back thousands! Worse still is the tooth has to be removed and you need an implant! This goes for children too; it’s critical to start them coming to us young, so that we can build a good relationship and get them into good habits early on. As a rule of thumb, three years of age is a good staring point. The dentist- A dentist you trust and like, who provides quality treatment, has your best interest at heart, is good with kids, stays up to date with the latest developments, is passionate and has some experience under his or her belt. The practice- A modern premises with the technology and equipment to provide you with a high quality of care, strict sterilization procedures and in a location that is convenient and where you can get an appointment time that suits you and your family… as well as find a place to park!